With the price of gas this summer, I’m sure a lot of us are thinking more about staycations rather than vacations. I don’t blame you. We are on the same boat. We have a nice vacation planned for the fall when the prices are cheaper. So this summer, we are hanging around town. 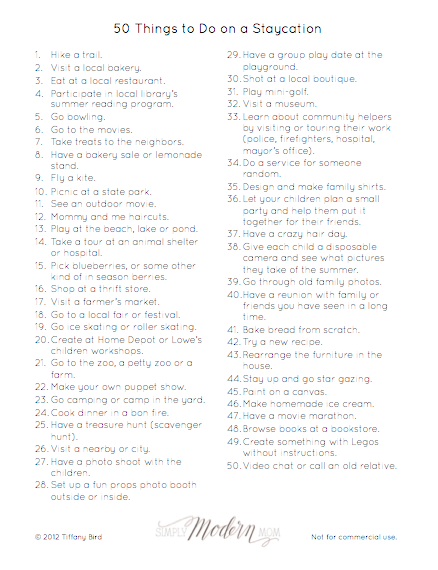 But I know I need to have a list of things to do with the kiddos to keep all of us busy. I would go nuts if the girls were at home with nothing to do all day long. They would fight constantly and destroy my house within seconds. Yeah, we need to get out. So I made a list of things to do on a staycation to keep everyone happy. Click here to download the Staycation To Do List. » Tell me… What are your summer plans? Are you staying around or going somewhere fun? Love this list. Will be doing some of these for sure! Thanks for posting. I added it to my summertime pin board! Thank you! This is great! Exactly what I’ve been looking for!! !